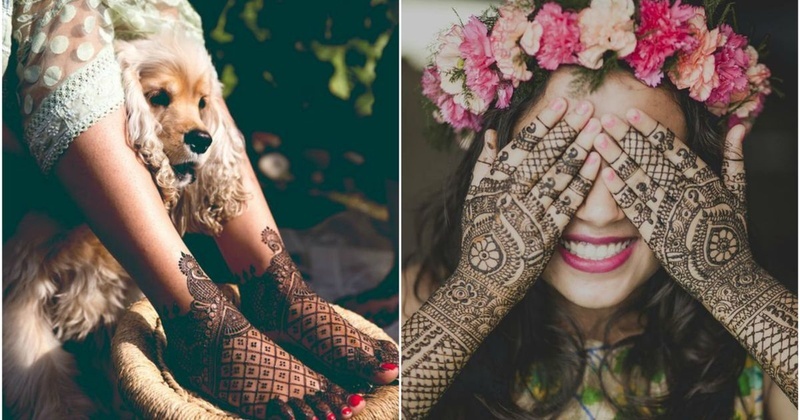 20 Must Have Mehndi Shots To Have At Your Indian Wedding! The pictures of your bridal mehndi design are some of the most essential parts of your wedding album. While your hand will be the most ornamented part of your body with the bangles, choodas and your engagement ring, your mehendi design will be the most highlighted part of it all! And while you will take tons of pictures of the same, we don’t want you to click the cliched showing-off-your mehendi pictures like Deepika and Kalki here. Brides who have fun at their wedding are the prettiest and this picture of the bride with the biggest smile had to be on the top of our list. Source - The Royal Affair. This picture of the bride chilling with her dog is too cute to handle. Weddings get a little too-much for the bride and she needs to take a breather every once a while. Here’s a capture of the bride’s mehndi with her gorgeous sandals. Brides spend endless hours deciding their wedding decor and a picture of the mehendi against it is a must-have. Mehndi pictures without the ones with the kaleere are just incomplete. If you too have the substance abuse problem of expensive footwear like Carrie Bradshaw, then ‘the one with your stilettos’ shot is mandatory. This picture where the bride is putting the final touch to her makeup and the mehndi is highlighted is too good to miss. We love how the mehndi is click beautifully while the bride is busy doing something with her purse. When the couple takes the vow to be with each-other ‘till death does them apart’ at their wedding. This bride seems to have gone for the ‘less is more’ approach for her mehndi. Her simplicity is captured beautifully in this shot. This one where the bride says ‘do not disturb us’ while we have a moment is definitely a keeper. Source - Cosmin Danila Photography. We love how all the colours compliment the mehndi design in this picture. Source - The Cheesecake Project. It’s true what they say, happy girls indeed are the prettiest. Source - Gautam Khullar Photography. We absolutely love how the mehndi is highlighted while the bride gets the ring on her finger. It's a classic picture of the bride in the arms of her forever while also flaunting her mehndi. This picture of the mehndi in focus against the bride’s lehenga is simply stunning. We love how the bride is showing her mehndi in a totally non-cliched way. This one's a keeper with the lights fading in the background, aromatic candles and rose-petals. Source - Mohit Birla Photography. We love this picture where the bride has gone all out to match the nail-art with her mehndi. It’s only natural to be a little anxious at your wedding day. We love how the bride is holding the ‘crossed fingers’ sign - a classic hand gesture that is believed to bring good luck.